WooCommerce Admin Custom Order Fields | 69% OFF! Admin Custom Order Fields Plugin for WooCommerce: Replace your CRM system, streamline ordering processing and create custom order fields using this robust WooCommerce extension! Download WooCommerce Admin Custom Order Fields Plugin at a 80% off discount! How Can WooCommerce Admin Custom Order Fields help your business? Traditionally, if you wanted to get additional information from a customer, you’d have to make use of manual methods like order notes, email correspondence and even reaching out via phone calls and log all of the data in external applications, like excel. You can say goodbye to all of that hassle right now! WooCommerce Admin Custom Order Fields is a powerful WooCommerce extension which allows you to seamlessly add your own custom order fields to orders on your online store. This enables you as a site administrator to ditch your expensive, bulky and dated CRM software for the most streamlined Customer Relations Management solution available to WooCommerce store owners! All of the information logged by WooCommerce Admin Custom Order Fields is stored right within the order page. This means no having to browse back and forth between CRM software, spreadsheets and emails for customer data. 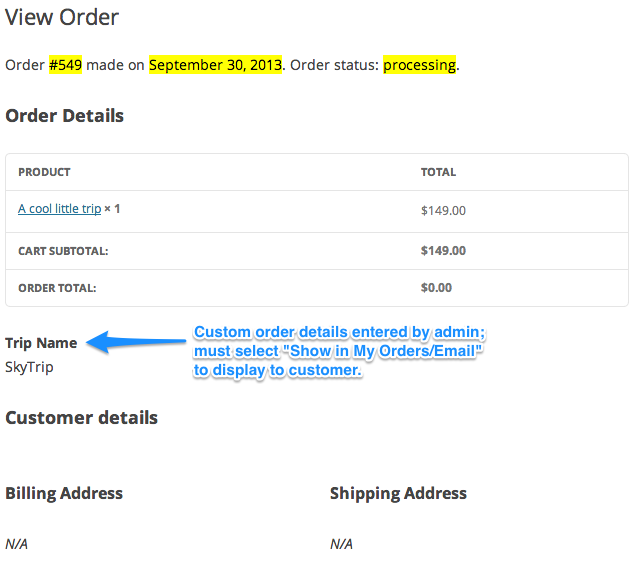 What’s more: you can even sort and filter orders based on data entered in the custom order fields you create. Replace your CRM system by logging CRM data right within WooCommerce, eliminating the need for third-party solutions, excel spreadsheets and long-winded, manual email correspondence. Display order fields and details to customers if you’d like to. Sort or filter orders based on data from your custom order fields. Create order details from the order page in your WordPress dashboard. Some examples of custom order fields. You can choose to display custom order fields to your customers, in this example, a customer was assigned to a specific trip through this simple system. Purchase WooCommerce Admin Custom Order Fields at a 80% off discount, and get an instant download! Admin Custom Order Fields for WooCommerce is licensed under the GPL, which allows you to use it on as many websites as you'd like without having to repurchase.